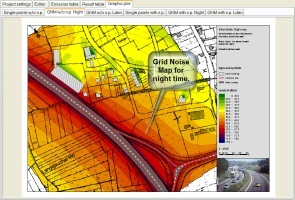 The majority of environmental noise simulations are small to medium projects tasked with checking the legal compliance of a planned road or an expansion to an industrial facility. These projects do not require the same complexity as is being offered in the full strength noise planning software products such as SoundPLAN. Noise modeling software suited for these projects must be specially designed to quickly acquire the model data via an import interface or allow digitizing the essential data on top of an aerial photography or plan bitmap. Results must be obtainable quickly without much formatting, yet it must be customizable enough so your company standard can be represented and you can be proud of your work. 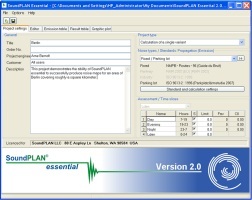 SoundPLAN essential is now available in the version 4.1, combining the full strength SoundPLAN calculation core with a simplified data entry editor to offer the noise modeling market a tool that can be learned in minutes yet powerful enough to allow engineers to do most of the noise modeling jobs. 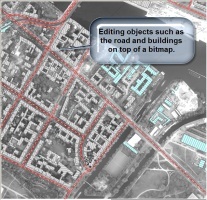 If your project is smaller with one industrial facility or some roads/railway lines, then SoundPLAN essential is better suited than a program designed to handle the complexity of noise mapping for an entire country. 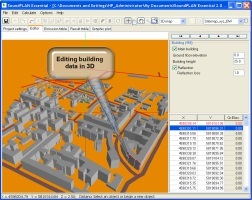 The data entry facilities are less complex but with the data import interfaces and 2D / 3D solid model viewing and the standard Dynamic Search SoundPLAN calculation core, the program offers enough flexibility and power to build a noise model quickly and get the results print ready in a snap. As the data structures are shared with the full program, the upgrade paths for data and also for the software itself are a possibility in case you do get the gigantic noise modeling job. 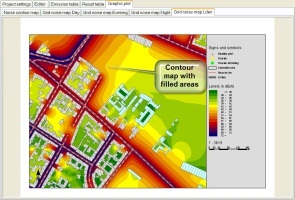 Documentation of the results in tabular form Pre-defined graphics for Grid Noise Maps and Noise Contour calculations. Included in the price is an online training. Interested or looking for demo version? Please send us an e-mail.